As the ‘Way of the Dead’ or the Lych Way morbidly winds its way down from Lydford Tor it reaches the river Cowsic and Conies Down Water at a ford known as Traveller’s Ford. On the west bank of Conies Down Water stands a large, black boulder that sits silently on the valley side. For centuries it must have quietly watched funeral processions wind their way up the small valley towards the church at Lydford. Despite its sorrowful past this spot is now a peaceful place where one can sit and stare. Far across on the opposite hillside the lonely menhir known as Beardown Man juts up out of the landscape as a reminder of man’s pagan beliefs. Sometime in the 1970s a small brass cross found its way into a small crevice in that large black boulder where for a good 20 years it sat hidden from all but those who knew of its existence, it became known as the ‘Traveller’s Ford Cross’. It did not take long for letterboxes to be sited in and around the cross and gradually its secret location became common knowledge. 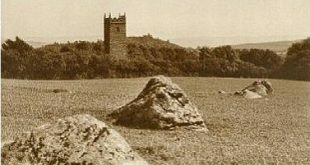 However, there is very little mention of the cross in any Dartmoor book so maybe it’s location was confined to the letterboxing world? But in a way the cross became one of those Dartmoor oddities where it’s nice to be able to knowingly nod your head when the subject arises because you are familiar with the location. Who put it there is a mystery but I have been told by a very reliable source that it was an ex-letterboxer who worked at the Plymouth Dockyard. Why it was put there is another enigma, suggestions range from it being a memorial of some kind to all those departed souls that were carried past it, to the cross just being something associated with letterboxes. But that’s the way the letterboxing world works, things appear as if by magic and nobody knows who is responsible. I think it is slightly ironic that on one side of the Cowsic valley is a pagan menhir whilst on the other, albeit a lot smaller, is a Christian symbol. What it did do was place the cross amongst the smallest on Dartmoor., in fact. to the best of my knowledge it was the fourth smallest cross. The one that held the title was a small cross made from nails that was placed on the side of Skir Hill with another slightly larger one nearby, this was followed by a slightly larger one on Hand Hill. There is a small metal plate with a cross on it just above the old Huntingdon Warren but this is not what could be described as a true cross. The Traveller’s Ford Cross disappeared sometime in the mid to late 1990s and many people lamented its disappearance as by then the cross had become one of those objects that had to be visited when passing. In 1997 I listed the cross in my ‘Pilgrimage to Dartmoor’s Crosses’ book and not long after its publication someone approached me in a pub one night. It transpired that they had found the cross which had become detached from the boulder and brought it home for safe keeping. Apparently they had then read my book and decided that I should be responsible for reuniting the cross with its original resting place, which was no problem. At the same time I was moving house and during the upheaval the cross once again disappeared, lost amongst the boxes of what the wife calls – Dartmoor Crap. Last week it was decided to clear out the Aladdin’s cave which serves as our garage and tucked in the corner was an old, cobweb covered box that on inspection was full of my old letterbox stamps that had been brought in from the moor. I decided to take a trip down memory lane and emptied the stamps in a huge heap on the floor. As I was sorting through them what should come to light? Yes, a rather tarnished Traveller’s Ford Cross. This time the cross will be replaced before it gets lost again and having cleaned off the years of Dartmoor aging it is possible to see that its made of some kind of copper alloy not brass as was originally thought. The actual cross measures 7.3 cm tall and 9 cm deep, the span of the arms is 4.8cm and it actually weighs 139 gms, there are several cuts along its length which appear to have been caused when somebody tried to prize it away from its fixing, apart from that there is no inscription. Here we come to the purpose of this web page, firstly to record the cross’s scant history, secondly to record a photograph of it for prosperity and thirdly to record its official re-instatement. On the 30th of December 2007 the cross was restored to its original boulder although it now sits in a small crystal and lichen cave on the opposite side to its original location. It somehow seemed fitting to re-install the humble cross in a miniature grotto where it can be sheltered from the vagaries of the Dartmoor weather. Once more sat above Traveller’s Ford it can observe the various parties of hikers and soldiers that make up the modern day traffic, no longer are the people mournfully weeping and wailing (well, not very often) as they pass up the valley. Hopefully, the cross will survive the ravages of the Dartmoor weather and the hands of those who want to steal it but certainly it’s better off in its original spot as opposed to being sat amongst a dusty load of old rubber stamps. Incidentally, as far as I know, the Traveller’s Ford Cross is now the second smallest cross on Dartmoor as both the Skir Hill crosses have long since disappeared. I have purposefully not included the full GPS co-ordinates in order to give the cross a longer lease of life. If you want to find it then it will have to be back to the old method – pounding up and down the hillside until you find it. It seems that someone has in fact found the cross and has been so kind as to steal it, I received an email from Paul Rendell on the 22nd of March saying that it had been missing for about a month. Like a phoenix from the ashes the little cross has once again risen and another is now in position.